Multiple diode lasers are now available, and different systems can emit infrared light at a variety of wavelengths, including 810, 940, and 980 nm. All of these devices are capable of being absorbed by the tertiary hemoglobin peak and can be effective in treating leg telangiectasia. The longer diode laser wavelengths penetrate more deeply than yellow light and are poorly absorbed by melanin, but they also have limited but significant hemoglobin absorption. For that reason, the 980nm diode laser can be safely used in patients with skin types I to IV skin. The 810nm pulsed diode used with a fluence of 80 to 100 J/cm2, a 12-mm spot size, and a 60-ms pulse duration demonstrated complete clearance of leg vessels in 15 of 35 patients after a single treatment, although at 6-month follow-up, only six patients maintained complete resolution of vessels. The 940nm diode laser had no effect when used to treat small blood vessels but was capable of improving larger visible leg veins of 0.8 to 1.4mm in 88% of patients in one study. Twelve of 26 patients treated with the 940nm diode laser at fluences of 300 to 350 J/cm2, 40- to 70-ms pulse durations, and a 1-mm handpiece demonstrated greater than 75% clearance after 4 weeks. A study of 20 patients treated with a single pass of the 940nm diode laser at 300 to 350 J/cm2, 40 to 70-ms pulse duration, and a 1-mm spot achieved greater than 75% clearance of treated blood vessels in 75% of patients at 12 months of follow-up. A study of the 980nm diode used to treat blue leg telangiectases achieved greater than 50% clearance of treated blood vessels in five of 10 patients. One patient developed post-treatment hypopigmentation, and one developed telangiectatic matting. By combining 980-nm diode pulses with radiofrequency current, lower fluences of 60 J/cm2 could be used for effective vessel clearance (50% of patients achieved greater than 75% clearance rate at 6 months), which may decrease the side-effect profile. Biopsies showed contracted vessels with hyalinization, suggesting that the combined diode and radiofrequency current therapy is an effective treatment for leg veins. Combining the 915nm diode with radiofrequency current demonstrated greater than 50% vessel clearance in 75% of patients. Facial telangiectasias are common lesions resulting from multiple factors. Multiple therapies and devices have been used for the treatment of facial telangiectasia with varied success and complication rates. The 532nm diode (diode-pumped, frequency-doubled Nd:YAG) laser is compared with other laser and nonlaser modalities for the office-based cosmetic surgery practice. The absorption of green light at 532 nm by oxyhemoglobin is very high, resulting in a high extinction coefficient. The 532nm green light wavelength is also absorbed by melanin. This is an advantage, for the 532nm (DP FD Nd:YAG) laser can be used to treat pigmented lesions. Although used frequently, care should be taken when treating darker skin to avoid epidermal injury. The 532nm diode (DP FD Nd:YAG) laser produces a 532nm wavelength that is strongly absorbed by oxyhemoglobin. Multiple 532nm lasers are available for the treatment of telangiectasias and pigmented lesions. The 532nm (DP FD Nd:YAG) laser is an extremely portable solid-state laser that enables transportation between offices or treatment rooms. 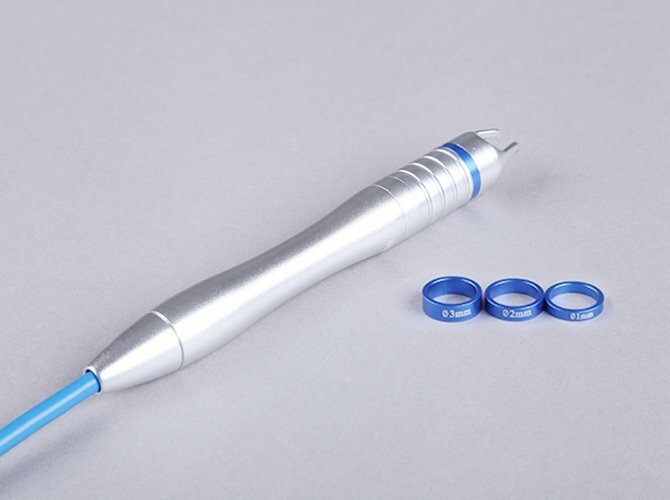 The small handpieces are very flexible and are well suited for the precision tracing of individual telangiectasias. The 532nm wavelength has been shown in multiple studies to be effective for the treatment of facial telangiectasia, minor vascular lesions, and some pigmented lesions. The portability, affordability, ease of use, and efficacy of the 532nm diode laser makes it well suited for office-based cosmetic surgery practice.